(Newser) – Those hoping to repair bicycles or fight forest fires will have good luck finding work over the next decade, but home health and personal care aides will fare even better, according to the Bureau of Labor Statistics' list of America's fastest-growing jobs. The US is expecting 0.7% job growth annually. But thanks to an aging population, the personal care industry is expected to add 754,000 jobs for 37.4% growth by 2026, while the home health industry is expected to add 425,600 new jobs for 46.7% growth. Together, that's more jobs than projected across the eight other fastest-growing fields combined, notes the Washington Post. The problem: They're among the lowest-paying jobs in the country, per 24/7 Wall St. 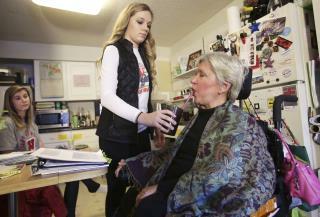 Personal care aides make about $21,900 annually; home health aides pull in $22,600. Honestly, all people need to "do" is be more careful with spending and such!!! I don't really understand why people have so many money problems!!! We need a Stalin...Yahoo CEO got fired and got $23 MILLION, Facebook CEO, Apple CEO, Amazon CEO get MILLIONS in salary and bonuses...type for a Stalin to step up. Most Hospital health Care Plans are some of the worst in any job field. You don't get free or low out of pocket costs even if you go to the hospital you work in. It doesn't matter whether its for Lab tests,exams or emergencies. You can actually get better health care plans if you work for a major grocery chain or almost any other job at a major cooperation. It's really Pathetic!